After my last blog post I received several questions about my nutrition plan and some of the gear I used for my swim and during my training. This post is going to focus on nutrition and fueling. I will do a follow up post focused on some of the gear I used in a few days. None of the following is a recommendation of any sort. This is the feeding plan that I have come up with that work for me and my body. My hope is that this will help give you some ideas of new foods and/or feeding intervals to test out. Some may work and some may not but that is the only way to find an optimal plan for you! I hope you find this helpful. I am providing links with every image of where I purchased my products from in the event that you do what to give them a go. I can’t reiterate enough that what I am about to describe is not a recommendation. This is the nutrition plan that I have come up with that works for me and my body. Throughout my training I have tried many different feeding intervals and foods. The following is what I have found works best for me. It keeps me fueled, hydrated and most importantly does not cause any stomach issues. The only downside is that it makes me have to pee..a ton! Keep in mind that when you are coming up with a nutrition plan that works for you, test it out extensively in training. If something isn’t working for you in training, then it certainly will not work on the big day. You should experiment often until you find exactly what works best for you. Overtime you may have to tweak your plan but it is worth it because nutrition can make or break you come race day. You should be confident in your feeding plan and nothing new should be introduced to it on the day or even a a week or 2 weeks leading up to your big swim. Carbo-Pro Carbo-Pro is a pure complex carbohydrate powder. I love it because it has no flavor when mixed with water. There are 100 calories per scoop and I will generally put 2 scoops per 20oz bottle. This is enough for 1 hour of feedings. This type of carbohydrate is quickly absorbed and helps your body use muscle glycogen as the main fuel source. This will help reduce the use of muscle proteins as a fuel source. 1 serving of this has about the same amount of carbs as 1/2 lb. of cooked pasta. For my long training swims and the Catalina Channel, this was a perfect fuel source to help keep me going. GU Roctane GU Roctane is the other powder based fuel source that I use. This is where I get my electrolytes, amino acids, caffeine and additional carbs during long training swims and my channel attempt. It is not overly sweet and the flavor is very subtle. After I do a feed with this, I usually instantly perk up and am more focused. 2 scoops of this mixed with 20oz of water is another 1 hour of fuel for me. Cliff Bar Cliff Bar is the only real solid food that I will use. I will eat half of a chocolate chip Cliff Bar every 2.5 to 3 hours. This provides protein and fiber so that I don’t get feelings of hunger and it breaks up some of the flavors so I don’t get sick of my other feeds. The only down side to this is that it requires chewing which makes the feed take longer than just liquid and gels. I also drink about 12oz of water with this to prevent dehydration from the protein in the bar. GU Roctane Gel I use the GU Roctane Gels only as needed. If I am feeling depleted and need a quick pick me up, I will use one of these. Within a minute or two of eating the gel I begin to feel better. The flavors of these are powerful and they can be very sweet. Be sure to try out different flavors when you are training to make sure you can stomach it. Personally the thought of eating a chocolate or peanut butter flavored GU in the middle of a 6 or 8 hour swim is nauseating. So I tend to stick to the fruit flavors but if you hate fruit then obviously you would want to pick a different option. I like to keep my plan relatively simple. I feed every 30 minutes and then the last hour to two hours of my swim I shift it to every 15 minutes if I am struggling. My feeds alternate between the Carbo-Pro and the GU Roctane. On the bottom of the hours I drink half my Blender Bottle of Carbo-Pro which is about 10-12oz of water and Carbo-Pro which is about 100-125 calories. Then on the top of the hours I drink half my Blender Bottle of GU Roctane which is about 10-12oz of water and Carbo-Pro which is about 100-125 calories. Every two and a half to three hours I will do my normal feed plus half of a Cliff Bar and an additional 12-18oz of water. Depending on how I am feeling, I may ask for a GU Roctane Gel once every few hours for a little extra boost. That is the plan I follow for the majority of the swim. If I am starting to fade in the last one to two hours, I start to feed every 15 minutes. These feeds are not so much for fuel but just for quick mental breaks. These feeds are about 10 seconds and usually involve a quick swig of Carbo-Pro or GU Roctane and a quick stretch. My normal feeds average around 15-20 seconds unless I need to pee in which case they may be closer to 1 minute. The plan is very simple and it works great for my body. I take in an average of around 250-350 calories per hour and about 20-24oz of liquid. Everyone is different so the calories I take in may be too much for some and not enough for others. This is why it is very important to experiment in training. There are a few additional elements to this plan that are very specific to me. For the past month of training including my Catalina Channel swim, I have been dealing with a shoulder injury. In an effort to keep the pain to a manageable level, I take Advil prior to swimming. I will then take Tylenol after 4 hours of swimming and then another does of Advil 4 hours after the Tylenol. This is not a long term solution and definitely should not be a practice followed for more than a few days in a row but it was necessary for me in order to get through my long training swims and my Catalina swim. Additionally, I get severely sea sick! The thought of being on a boat or in rough seas is enough to make me want to throw up. This is sad because I love being in the ocean. Sea sickness usually leads to vomiting and once you start vomiting up your feeds, then none of the nutrition from feeds is staying with you. This sickness will most likely be severe enough to force you to end a big swim. Luckily I know this about myself and it is important for you to know this about yourself too. Since I know I get sea sick easily, I take Bonine before my big ocean swims. It isn’t enough to just take it an hour before, I have to start a few days prior. I will take 1 pill before bed 48 hours before the swim, then 1 pill 24 hours before the swim, then 1 the morning of or 1 hour before the actual swim. You need to build up the medication in your system for it to be fully effective. I do this before all my ocean swims and all my Scuba dives and it has kept all sea sickness away. I personally prefer Bonine because it does not make me drowsy like Dramamine. Dramamine makes me fall asleep instantly and then I am out for days. Bonine will make me a bit hazy on the first day and then I have no hazy feelings at all after the first 12 hours or so of taking the first dose. This is why I start 48 hours before and take it before bed. By the time the swim rolls around, all those side effects are completely gone and I feel totally normal. If you don’t get sea sick, then you are lucky and none of this matters to you but if you do then you need a plan! I hope you find this helpful as you experiment with different feedings plans. I am always looking or new ideas for myself and to pass on to fellow swimmers. I would love to hear what works for you during your training and long swims and so would other swimmers, so if you are comfortable sharing please post some of your plans in the comments! Today is the final part of this series on preventing shoulder pain through proper recovery and entry technique. The final portion of the recovery and entry that can help prevent a shoulder issue is the entry depth. The goal depth for a swimmer to shoot for is 8 to 10 inches deep. If the entry depth is shallower than this, it can create a shoulder problem later on. If the entry depth is deeper than 10 inches, it will lead to inefficiency in the stroke and pull. We are going to focus on entering to shallow since this can cause damage in the long run and because it is an extremely common problem in swimmers. A brief side note, entering deeper than 10 inches is not likely to cause injury to a swimmer but it will create inefficiency because the swimmer will grab and pull less water. Now on to the fun stuff! Why do swimmers want to enter 8 to 10 inches deep? Entering 8 to 10 inches deep is the perfect depth is because the latissimus dorsi is activated and the SITS muscles are bypassed at the start of the pull. When a swimmer enters shallower than 8 inches, he or she is using the SITS muscles to initiate the pull rather than the lats. This will put a great deal of pressure on the SITS muscles which can lead to tendonitis or impingement in the long run. This is also inefficient because starting the pull from less than 8 inches is not a linear motion. This is more of a pressing down motion, which results in lifting the body up not forward. This shallow entry depth is the major problem that is seen in many swimmers. If a swimmer has the proper body position, this upward motion is unnecessary and a waste of energy because the swimmer is already as high as he or she can be in the water. To illustrate the pressure on the shoulder of entering the water less than 8 inches, try this small exercise. Next time you are at the pool go to the shallow end. Put your arms on the wall with your palms down, and squat down so your shoulders and hands are in line with each other. Now press down with the palm as you would if you were swimming. You will feel your shoulder muscles doing all the work and none of the lats. You can even do this sitting at your desk reading this blog right now. 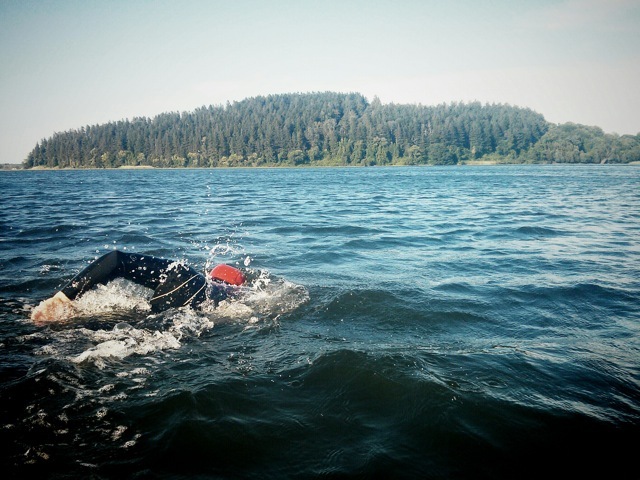 This simulates the muscles working when you enter the water and start your pull from a depth less than 8 inches. Now imagine sprinting and really putting a great deal of pressure as you pull, that is a lot of pressure that you put on your shoulder. You can now simulate doing it the right way by standing up a little and angling the arm so that your hand is about 8 inches lower than your shoulder, turn your elbow up slightly, and then put pressure on it. The lat should activate and there will be little to no SITS muscle activation. That is what you want it to feel like when you pull. There are a few reasons why this is the goal feeling when swimming. As we discussed earlier, pulling with the lats is safer because there is less chance of injury. It is also faster because the lats are more powerful muscles and they are fatigue resistant. In this case it is also better because now the swimmer eliminates the downward press that lifts you. With the proper entry depth the swimmer can from 8 inches deep immediately into your grab and pull. Now you are no longer wasting energy and everything you do is moving you forward rather than up and then forward. Swimming is a linear sport and everything moves from front to back and back to front. Any time a part of a swimmer’s stroke is not linear, then he or she is introducing inefficiency and a higher risk for injury into the stroke. In this case, if a swimmer enters too shallow then he or she is pressing down. This is not a front to back motion so it is inefficient and creates and opportunity to get hurt. A good way to tell if you are entering at the proper depth is to be aware of what muscles you feel working. Depending on where you feel the tension in the body, you can get a general idea of your entry depth. If you enter too far out front and are 1 to 2 inches deep, then you will feel the pressure in your deltoid. If you are entering 2 to 4 inches deep, then you will feel the tension more in the triceps and a little in the armpit. If you are 4-6 inches deep, then you will feel the tension in the arm pit. Finally, if you are 8 to 10 inches deep then you will feel the lats doing all the work. So based on this you can get a general idea of how deep you are actually starting your pull. Check out the video below. Franco (the swimmer in the video) is demonstrating the proper pull depth and the proper grabbing of water. This should help give you an idea of what you are shooting for with your stroke! Another good drill to do is shark fin with a touch. This drill is when you start on your side kicking with one arm extended in-line with the shoulder, palm down, with the hand 8 to 10 inches deep. With the top arm you will lift the elbow to the ceiling and let the forearm and hand relax so that they end up next to your shoulder roughly 4-6 inches from the body. Hold this shark fin position for a couple of kicks, then when you are ready you will swing your hand and forearm forward keeping your elbow nice and high and touch the water with your finger tips where your goal entry position is and hold it for a few kicks. Then when you finish this, bring the arm back into shark fin and then bring it down back by your side. You will repeat this several times and then you switch arms and do the same thing with the opposite arm. When doing this drill make sure you are not breathing when the elbow is up, only breathe when your top arm is relaxed resting on your side. This drill really allows you to zone in on where you want to enter. The last drill to work on this is catch-up drill with finger tip drag. This drill will allow you to work on the high elbows and the entry at a tempo closer to normal swimming. With this drill you will do regular catch-up drill and with every stroke you want to drag your finger tips across the water keeping the elbow nice and high. The focus should be on driving the hand, finger tips first, into the water half-way between your head and full extension to get to that entry depth of 8 to 10 inches deep. Your goal should be on keeping the elbow high as you enter the water and then extend out and down. All these drills explained above should help you come closer to achieving the goal of keeping the elbow up and entering 8 to 10 inches deep which sets you up for a safe and efficient pull! The goal for any level swimmer, especially in the off-season, should be to really zone in on technique so when the season does start and the volume starts to increase the technique happens naturally. This type of training will make you much faster as a swimmer and it will help to protect your shoulders and help to reduce the risk of shoulder injury through your swimming and/or triathlon career. Many swimmers do not enjoy doing drills and beating the technique into their heads, but it makes life much easier in the long run. Even though this type of training can be very tedious, it will really help to give you the muscle memory necessary to keep those shoulders safe and it will help your mental training as well. These drills can be difficult and they take a lot of focus, so doing these drills after a hard set is always a good idea. Normally in a hard speed set the first thing to go out the window is technique. By doing these drills as recovery from a hard set, you are reminding your body of what it should be doing. This will help your body remember the technique more effectively and it will train you to keep your mental focus even when you are tired and are suffering. The common technical flaws described are not necessarily things that all people do and sometimes people will develop shoulder pain from other parts of the stroke not discussed in this series. The goal of this post is to pin point a few key areas to focus on that I have seen cause shoulder pain in many swimmers in the recovery and entry portion of the stroke. There are other points in the stroke to consider that may cause shoulder pain and injuries that I will be covering in future blog posts. Some people are lucky and may make these errors and will never get a shoulder problem. Other people are unlucky and may do everything perfect but the repetition of the stroke alone is enough to cause this type of pain. Whichever category you fall under, it is always best to practice proper technique to help prevent these injuries and to increase stroke efficiency. The best thing that you can do to make sure that you have safe, efficient technique is to get a video analysis of your stroke. This way you have a coach look at you and tell you what looks good and what needs work and best of all you get to see it in action! This is a service that I offer and you can get more information on this by contacting me by commenting on this post or by checking out my website www.enduranceswimming.com. Most local coaches should offer this service as well and it will really help improve your stroke! I hope that you found this series helpful in providing you with guidelines to a safe and efficient recovery and entry for the freestyle stroke! Make sure you practice all the drills seen in this series as much as you can to really make the technique second nature. You will be swimming faster and pain-free before you know it! Be sure to check back for our post on dry-land exercises that will help prevent injuries in swimming and make you a faster swimmer. Welcome back! Today we are going to continue discussing proper techniques during the recovery and entry of the freestyle stroke to help prevent and/or reduce shoulder pain and inflammation. A few days ago we covered proper hand position upon entering the water and the effects that this can have on the pull and your shoulder. Today we are covering the second common problem that is seen during the entry of the stroke. That common technique flaw is the location of entry, meaning where the hand actually enters the water. The location of entry is a very difficult technique to figure out. The main reason for this is because a swimmer cannot actually see anything that is going on above the water, so he or she just goes with what feels right. It is for this very reason that working with a coach is essential on the road to good, safe technique. Unfortunately, what feels right and natural may just be a bad habit. There are a few possible places where the hand will enter incorrectly. These places include across the mid-line, too close the head, and too far out in front of the head. The best way to enter the water is finger tips entering first, in-line with or just wide of the shoulder, half way between your hand and your head during full extension. This will put your entry point a few inches beyond your head. Many swimmers, especially people new to swimming, will enter either right next to their ears or across their mid-line. These three errors will be the focus of our discussion today. We will start first with examining why swimmers cross over the mid-line during the entry and how it can lead to shoulder pain. The mid-line is just what it sounds like. It is an imaginary line that goes from the top of the skull down your body separating your body into a right and a left half. When a swimmer’s arm enters across the mid-line, the arm tends to go across the body even more as he or she rolls and extends the arm. Instead or starting the pull in-line with the shoulder of the pulling arm, it starts the pull in-line with the opposite shoulder. This is an extremely inefficient pulling position because there is no way to grab any water before pulling. This also means that the SITS muscles are doing all the work to pull which is not what you want. It is the use of the SITS muscles rather than the lats during the pull that may eventually lead to inflammation and pain. If you do not understand why to use the lats instead of the SITS muscles, please read part I of this series that was posted last week. The goal is for the arm to enter in-line with the shoulder of the pulling arm. This allows for a safer and more efficient pull. A swimmer may cross over for two reasons. The first reason, as explained above, is because the swimmer naturally has a point of entry that is across the mid-line which has become a bad habit for the swimmer. The second reason why an individual may enter and pull across the midline is because the swimmer drops his or her elbow to the side as the hand enters the water. If a person enters the water in the proper place or across the midline and he or she drops his elbow while entering the water, the result is the same. 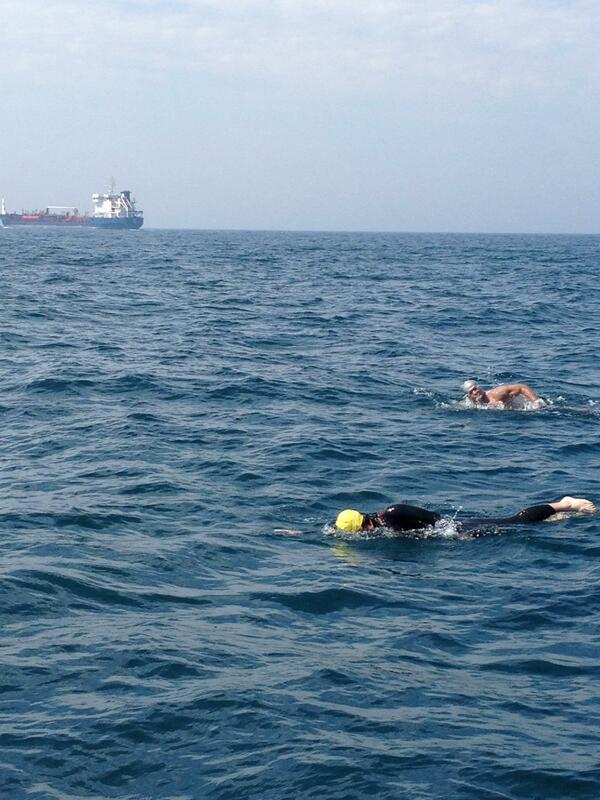 Both of these swimmers will cross over. As the elbow drops down to the side, the hand will go from aiming in the direction the person is swimming to aiming to the side of the pool. The arm will go in the direction the hand is pointing as the swimmer rolls and extends the arm down and out. As the elbow drops to the side, the hand begins to aim to the side of the pool across the body. This will cause the swimmer to cross over setting up an inefficient and dangerous pull. The goal for proper technique is to enter the water finger tips first, in-line with the shoulder or a tad wide of shoulder width apart, keeping the elbow nice and high, and 8 to 10 inches deep. The second common problem area is entering to close to the head or next to the ear. This is a problem of inefficiency rather than a dangerous pull; however, depending on what a swimmer does after entering it can set up a dangerous pull. When a swimmer’s hand enters the water right next to the ear or head, it causes the swimmer to drive their hand straight down rather than down and out to about 8 inches deep. In a few days we will be covering the importance of an 8-10 inch deep entry so check back for that explanation. This swimmer may actually be starting their pull 1 to 2 feet deep rather than 8 inches. The problem with this is that the swimmer is not actually grabbing much water to pull. Grabbing the water is the most important part of the stroke because grabbing more water to pull will allow you to go faster. By entering close to the ear, the swimmer will tend to grab less water and as a result have an inefficient pull. This inefficient pull will generally not cause a shoulder issue; however, swimmers that enter at the ear realize that they need to grab more water and it is the way they go about grabbing more water that can lead to a problem. This variation is that the swimmer after entering deep, because he or she entered the water next to his or her ear, will then let his or her arm drift up to the surface as the swimmer rolls onto the side and extends the arm forward. The problem with this is now the swimmer is pulling from a point that is too shallow and this puts a lot of pressure on the SITS muscles and shoulder. It is this problem that can lead to a shoulder injury. This will be covered in-depth in our post about entry depth in a few days, so hang tight and check back in a few days for corrections to this problem. The third common problem is entering the water way out in front of the head. The goal entry location as we stated above is to enter the water half way between the head and full extension, in-line or just wide of the shoulder, with the finger tips first. The reason for this location is to ensure that the hand extends to the proper location in order to set up a safe and efficient pull. When a swimmer enters the water with his or her hand at full extension or beyond the proper location, he or she is setting up a pull that will use the SITS muscles rather than the lats. Once again the shoulder problem is created because it is setting the pull up wrong. It is the start of the pull and the entry depth that will actually put the pressure on the shoulder but the entry location needs to be correct in order to prevent this improper pull. When a swimmer enters too far out front, he or she will start the pull from the surface which puts a lot of pressure on the shoulder and the SITS muscles and uses no lat muscle. It is this pressure that may cause shoulder pain in the long run. By entering at the proper location, this pain can be avoided because it will ensure a proper pulling depth and the activation of the lats for the pull rather than the SITS muscles. This concludes part II of this three-part series. Part III will be focusing more on entry depth and how setting this up properly is essential to a safe and efficient pull using the Lats rather than SITS muscles. There is a lot of information here and not all of it will apply to you. Generally a person has one of these three problems not all three, but it is important to be aware of all the areas the stroke can go wrong. Knowing these different areas will help you to maintain a proper stroke and keep those shoulders pain-free for a long career in swimming and triathlon. Correcting these problem areas does not guarantee that you will never have shoulder pain or injury, but entering at the proper location will help to lower the risk of injury. Please feel free to comment on anything mentioned today and ask as many questions as you like. Also a special thanks goes out to our strength coach Franco Zuccoli for demonstrating the drills properly in all the videos seen today. Come back in a few days for part III. Start getting excited now because you are almost swimming pain free! Shoulder injuries and shoulder joint pain are both very common in swimming and triathlon. More often than not, these shoulder injuries are a result of a flaw in stroke mechanics. It is for this very reason that I have decided to write about this topic for you. Every swimmer and triathlete wants to have a long career. The only way to last in these sports is to remain injury free and that is why this is such an important topic for swimmers and triathletes of all levels. My goal is to explain to you the common flaws that I have seen in swimmers who end up with shoulder injuries in the recovery and entry portion of the freestyle stroke. I will then go on to explain the technique you want to shoot for and give you some drills on how to go about achieving that safe and speedy stroke! There is a lot of information here and I do not want to make your brain explode and ooze out your ears, so I have decided to split this up over 3 posts. Over the next week, I am going to post a common error that I see in the recovery and entry of the freestyle and then I will explain how to correct it. In today’s post you will also be getting a little anatomy lesson on the rotator cuff to help give you a better understand about why shoulder injuries occur in swimming. I hope that you find this informative and useful in protecting your shoulders from preventable injuries in your quest for a long and successful swim and triathlon career! Now that we are done with our brief anatomy lesson and are experts on the shoulder joint, we can move on to the good stuff. The common flaw that I am going to go over today is proper hand position during entry. Many of the flaws that I will be explaining over the next week are hard to catch and that is why it is always important for swimmers of all levels, but especially beginners, to work with a coach. A good coach will be able to spot these key flaws immediately and will help you to correct them in an effort to prevent any shoulder injuries. During the entry there are a couple of places that can create shoulder pain. The main focus of today’s post is hand position. We will be covering the other points later this week, so be sure to check back in a few days. When entering the water, it is important for a swimmer to enter the water with his or her finger tips first. The common mistake that I see over and over again is swimmers entering the water thumb first. The problem with a thumb first entry is that it sets up an improper pull. This is where inefficiency in the stroke as well as a possibility for injury can occur. When a swimmer enters the water thumb first, the first motion that usually occurs once the hand is in the water is a sweeping motion. This sweeping motion happens because a thumb first entry causes the palm to face away from the body, so the first thing that the hand has to do to start the pull is push out to the side before grabbing any water. This is inefficient because it is not helping the swimmer move forward. All this does is push water off to the side which really does nothing for you but waste energy. The really important issue is how this can cause an injury. When a swimmer enters the water with the thumb down and sweeps out to the side, this is the SITS muscles at work. This sweeping motion puts a great deal of pressure on the shoulder joint at the top of the deltoid, which covers the SITS muscles. It is the repetition of this unnatural pressure on the shoulder that can cause inflammation in the joint leading to tendonitis or worse. If this thumb first entry happens a few times it is not a big deal. However, if this is a habit for a swimmer this is occurring about 18 times per 25 yards (9 strokes for each arm). So if this person practices 3 times a week and does 3000 yards at each workout then he or she is putting this unnatural pressure on the shoulder joint approximately 3240 times per shoulder (6480 strokes divided by 2 shoulders). Take these numbers and then throw intensity into the mix. The faster one tries to swim, the greater the pressure on the shoulder becomes. This adds up quickly and it is no surprise that entering thumb first and sweeping the palm out to the side to start the pull can cause shoulder pain or even injury if not corrected. The proper hand position to help prevent injury is a finger tip first entry. When a swimmer enters the water finger tips first, it allows them to bypass the activation of many of the SITS muscles. This entry means that your finger tips will enter first so that your palm faces the bottom of the pool rather than the side of the pool. Now a swimmer is more efficient because he or she can go right into grabbing water rather than pushing it out-of-the-way. This will create a faster pull and the opportunity to grab more water to pull with each stroke. An easy way to remember the proper position is this: if you are entering the water thumb first, then you are giving yourself a thumbs down! Both of these drills will allow you to slow down the stroke and focus on how the hand enters the water. Correcting hand position is difficult because of the fine motor movements involved but it will make you more efficient and will help to prevent shoulder injuries in the long run. If you are not sure if you are doing this properly, every once in a while when you are swimming look forward and watch your hands enter. You will see clearly if you enter thumb first and sweep to the side or if you enter finger tips first. That concludes the first part of this 3 part post. Check back in a couple of days for the second part in which we will be going over the proper location of entry. If you have any questions or need more clarification on the topics discussed in this post please feel free to comment and I will do my best to answer your questions. I also want to thank Franco Zuccoli, the swimmer you saw and will be seeing in the videos posted today and over the next week. He did a fantastic job showing you how to do the drills properly! He is our program strength coach and I have been working with him for quite some time now. For more information on his work check out: http://www.Francozuccoli.com. In the next few weeks, Franco and I will be collaborating on a post that will provide you with a strength training program that will help protect your shoulders and will make you a stronger swimmer! Thanks Franco! Stay tuned for more technique tips and earn that easy speed by increasing your stroke efficiency through technique!